Shanghai (AFP) - China stocks took another plunge Wednesday, as the securities regulator warned the market was in the grip of "panic" selling after fresh government moves failed to arrest a rout that has now infected regional markets. Confidence took a hit as trading halts expanded to cover more than 1,300 companies -- nearly half of mainland listings -- to prevent further sharp declines in their stock prices. 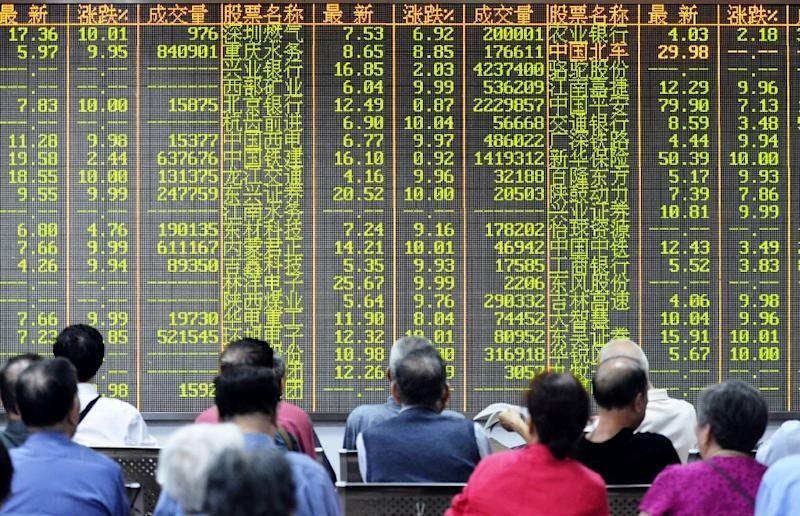 The benchmark Shanghai Composite Index closed down 5.90 percent, or 219.93 points, to 3,507.19. The Shenzhen Composite Index, which tracks China's second exchange, dropped 2.50 percent, or 48.38 points, to 1,884.45. "There’s really panic out there," Tony Chu, a Hong Kong-based money manager at RS Investment Management Co., told Bloomberg News. "I wouldn’t suggest catching the falling knife." The latest tumble came despite the government announcing new measures to support the market, including allowing insurance companies to invest more assets in stocks and a programme to buy the shares of smaller companies. "Investors' panic and irrational sell-off caused a liquidity strain on the stock market," Deng Ge, a spokesman for the China Securities Regulatory Commission (CSRC) -- the market watchdog -- was quoted by state media as saying. 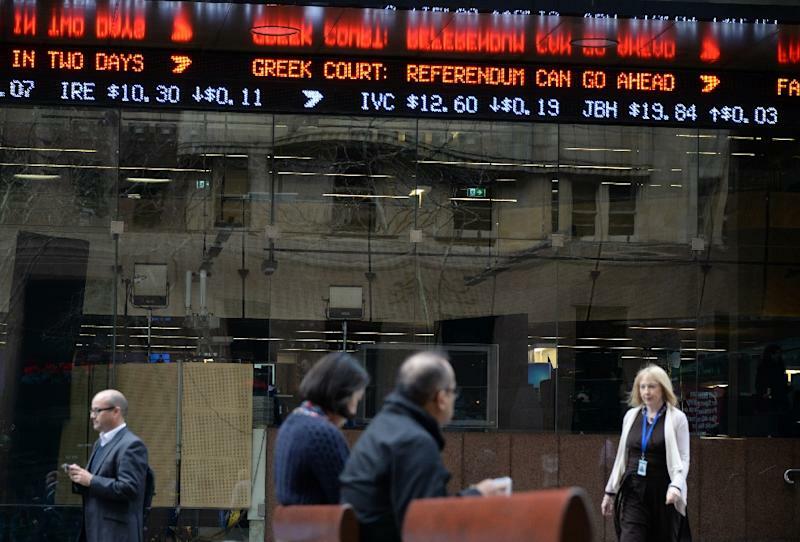 Asian bourses, already under pressure from the protracted Greek debt crisis, also posted sharp declines as contagion from the rout in China spread, with investors running for safe-haven assets such as the yen. Hong Kong equities plunged 5.84 percent to their lowest close since early January, Tokyo dropped 3.14 percent and Sydney retreated 2.01 percent. US-listed Chinese stocks were also marked down overnight despite gains across all three main indexes on Wall Street. 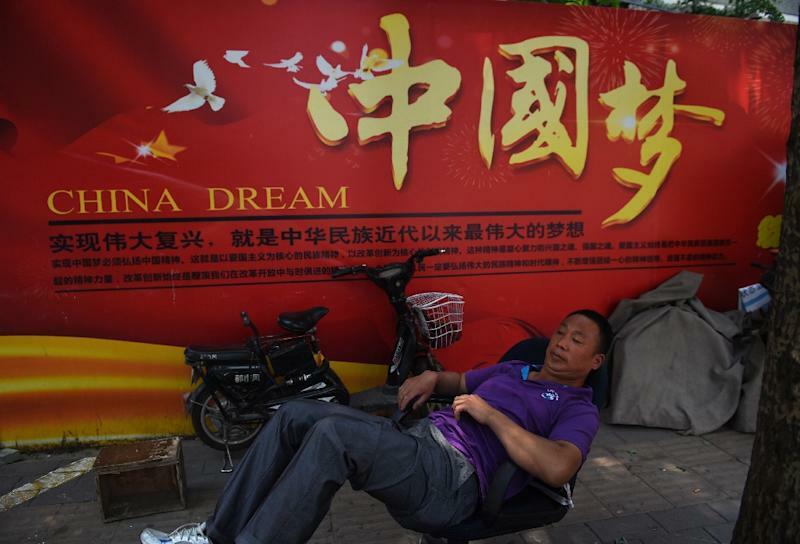 By the close on Wednesday, the Shanghai market was down 32 percent from its peak on June 12, when it had risen by more than 150 percent in 12 months, in a borrowing-fuelled frenzy powered by millions of new retail investors. Analysts say the resulting deep correction has been mainly triggered by new restrictions on margin trading -- a practice that magnifies both profits and losses -- and accelerated by concern about overvaluations. Among the latest interventions by Beijing, the country's 111 major state-owned enterprises were barred from selling shares in their listed subsidiaries by the State-owned Assets Supervision and Administration Commission, which oversees them. For its part, market regulator the CSRC urged shareholders with stakes of more than five percent in listed companies generally to buy more. The insurance industry regulator said Chinese insurance companies will be able to invest up to 10 percent of their assets in a single "blue chip" stock, up from the previous five percent. Separately, the state-backed China Securities Finance Co. will "increase" stock purchases of small- and medium-sized companies while pledging 260 billion yuan ($43 billion) in credit to brokerages for buying stocks. The People's Bank of China, the central bank, also pledged to support the "stable development" of the stock market by helping the China Securities Finance Co. raise funds, according to a statement on the bank's website. On Sunday, the government said the central bank would provide funds to the China Securities Finance Co. to help "protect the stability of the securities market". At the weekend, the CSRC said there would be a temporary halt to initial public offerings, which by offering near-guaranteed profits tend to drain funds from the rest of the market, hurting prices and sentiment. In the wake of the stock market slump, at least 1,301 companies have halted trading on mainland Chinese exchanges, locking up $2.6 trillion of shares, or about 40 percent of the market’s capitalisation, Bloomberg News reported. "With so many companies suspending trading, it will hurt market liquidity and cause the risks to collect in the rest of the firms still trading," Yingda Securities analyst Li Daxiao told AFP. China’s two oil giants were among the biggest losers in Shanghai on Wednesday. PetroChina slumped 9.07 percent to 12.33 yuan while Sinopec fell by its 10 percent daily limit to 6.72 yuan, despite saying its net profit likely rose by more than 1,000 percent in the second quarter from the previous quarter. Brokerages also fell in Shanghai. China Merchant Securities plunged 9.77 percent to 22.07 yuan while Citic Securities lost 10 percent to 23.43 yuan.